We rode in a very small part of Japan, near Osaka and on Shikoku Island.The great infrastructure includes many separate bike lanes an paths (usually along rivers). Quality is the hallmark. But there’s just too much urban slogging. Slow and monotonous. Highlights are the river bike paths (Osaka to Kyoto and Kyoto to Nara) and the bridge route from Imabari (Shikoku Island to Onomichi Kansai area). You live well but at a very high cost. Going through tunnel for bicycles only on Shikoku. All of Japan has good infrastructure including roads. Almost always there is a separate bike path or adjacent bike lane. But they are built for local commuters not for travelers. So, Occasionally you have to use the roadway that is almost always busy. A big negative in the built up areas due to frequent and long traffic lights. It’s a crowded place. Shikoku Island is a rural island for Japan but by most standards it’s urban. Kansai is one big urban area. However we really didn’t go inland often and the coast is way more built up. So where we were, the traffic was heavy but we often found separate bike lanes. Let it be said the bike traffic is also very heavy. In spring (April) it was cold. In Autumn (October) it was nice and warm (not a normal fall). It’s maritime so the surrounding seas have to get warmed up. It rains but we had good luck. The winds can be strong and from any direction. North east (cooler) one day and South west (warmer) the next. Excellent, detailed maps are available at the Tourist Information offices at the bigger train stations. Also, they have info on sights, hotels and even restaurants. Our Lonely Planet Guide had little info outside the major tourist centers. Sometimes Tourist offices even have bike info. Due to the bike lanes and the courtesy of the drivers you usually feel very secure but occasionally you are out on a narrow highway with fast moving traffic. The worst part is other bikers who have no fear and often are speed demons. Its one of the safest places in the world. Not perfect but pretty close. Very, very honest, even in the cities. Prices are high. A basic hotel is over $100. Everything else costs plenty. On the other hand, everything is clean and good quality. Its hard to live on $200 a day! You can drink the tap water everywhere. Then there are conveince stores about every 100 Meters with all the stuff including good coffee, fruit juice (cheaper than soft drinks). Of course there’s tea and beer everhwere , also Japanese Sake. Every province has its specialties so its fun to try them. Of course, the food is clean and fresh. The Sushi is delicious and the chain noodle shops are perfect for lunch. They are private people and very much on to themselves. That being said they are as kind, helpful and courteous as any people in the world. Their English language skills have improved greatly but they are not overly gregarious with foreigners. One of many castles along the way on Shikoku Island. It’s an unique and interesting place. Current Japan is very private but fascinating. The urban jungle (it’s a very populated place) is punctuated with ancient jewels ie. temples, palaces, houses and gardens. It’s a place that is unto itself. Food, service, honor and work ethic. Along Hwy 26 (not the expressway). Poor bike path (sidewalk). At 20Ks cut inland. Sometimes there’s no bike path. Sometimes there’s a bike path (separate). Gradual climb to 20Ks then down. At 31Ks over a river then right to Wakayama Port at 33Ks. Out to Hwy 55. Bike path next to Hwy. Mostly fat thru a short tunnel. At 33Ks, take 55 left (straight leads to an incomplete tunnel). Now 2-lanes, on and off bike lane then some hills. At 40Ks climb moderately to tunnel at 43Ks. There is a bike lane. Another tunnel very narrow bike path (we walked). At 44Ks, Hwy 55 splits, left no bikes. Now good biking. At 46Ks thru a narrow tunnel but light traffic. Very good scenery. Excellent road. Twists and turns. Moderate traffic. At 56Ks, roads join. Down to Hiwasa then climb to 62Ks. 700 meter tunnel with a bike lane on right, gradual mostly down to the coast at 72Ks. Easy riding. Lots of short tunnels. Views. Bike lane to Kaifu at 85Ks. Hwy 55, through some tunnels. Then along the beach. No bike lane but light traffic. Great scenery. Tailwind. Cape at 49Ks. Now winds (NE) awhirl. Moroto at 5Ks. Calmer winds, tamer scenery. More population and traffic. Usually a bike lane. Flat. Nahari at 82Ks. Hwy 55, more traffic but usually a good bike lane. At 15Ks, Aki. Now a separate “cycle road”. At 35Ks, bike lane ends. Back on Hwy 55. Its now urban with a bike lane. We got a few fun Ks on a parallel road on the left but basically slogged into Kochi at 56Ks. Nothing great except the “cycle road”. Out to coast on Hwy 34, long tunnel, narrow bike lane. At 10Ks, T-junction, right on Hwy 14. Then onto Hwy 23. Now little traffic, sometimes very narrow, good scenery. Twists and turns. At 36Ks up to a narrow tunnel. Off and on bike lane. Today rain. Then straighter and wider Hwy. At 38Ks up a narrow (hairy) tunnel. At 49Ks, before Xway, left into Susaki at 50Ks. (Almost 20Ks longer than Hwy 56). **We tried 381 but it wasn’t the quiet route we had hoped for so we returned. On 56, hills, bridges and tunnels. Mostly no bike lane. Good scenery. Heavy traffic so a little hairy. At 21Ks thru a tunnel then at the sea. A good bike lane. Mild head winds. At 25Ks, small road along coast, back to Hwy 56 at 33Ks. At 38Ks, stay left for bike path around park. Straight on Hwy 56. Urban with a bike shoulder into town at 54Ks. We took a ride up the bike path to narrow bridge at 9Ks, crossed and continued up river to Hwy 441 at 14Ks, then returned. Great riding. Out on bike path along river then along Hwy 321. Sidewalk bike way (poor) to long 1.5K tunnel, very dark at 15Ks. Bile lane then variable bike lane. At coast hills. Sometimes no bike lane but less traffic. Shimizu at 32Ks. Out on Hwy 27. Bike path for 6Ks. Then very narrow (so narrow its safer on a bike). At 11Ks, wider with bike lane. At 14Ks pass Hwy 348. At 16Ks, Ashizuri Cape. A little of everything. At 27Ks, off of Hwy 27 on to 348. Straight. Into Shimizu at 30Ks. Fun. Light traffic on a Monday. Hwy 321, beautiful coastal scenery. At 10Ks, away from coast for 6Ks then again at the coast. Variable bike lanes. At 30Ks, cut inland to Otsuki, hilly. Mostly inland. Good scenery. Back to the coast. Sukumo at 54Ks. Winds swirl here. Light traffic. Hwy 321. A little of everything. Lots of tunnels. Some with narrow bike lanes, and then separate bike tunnels for bikes only! Often the bike lane is non-existent but light traffic. Then after Ashizure Park there is always a bike lane. Inland. Long valleys to tunnels. Some great coastal scenery. Winds swirl in this area. Last 8Ks into Uwajima are urban sidewalks. Town at 67Ks. On Hwy 56, a separate bike lane. Gradual climb to 7Ks, then down moderate to the sea at 9Ks. At 11 Ks, pass 378 (to coast road). Gradual climb thru 7 tunnels. Very narrow shoulder. There is a 1320 meter tunnel. Gradual down at 19Ks on bike lane, Seiyo at 21Ks. Flat to 30Ks then up to 1117meter Tunnel. Very narrow shoulder but descending and fast. Gradually down to Ozu at 40Ks. Busy road. Mostly a follow wind, some good views. (On Hwy 56, its 53Ks inland). We went along the river to the coast at 17Ks. there are two ways: 1) #24 on the left bank (quieter) but narrrower or 2) #43 busier (except for 3Ks) all on seperate bike lanes. T junction at 378. Right. 2-lanes, busy. After 2Ks, a seperated bike lane. Good views. At 39Ks, no bike lane. Away from the ocean. Gradual 2Ks climb then a bike lane near the top. Down. City riding. Meets Hwy 56 at 49Ks. Bike lane into the center at 59Ks. Soft head wind. Out on sidewalk/bike lane on 196. At 7Ks, off 196 on 347. Along coast. Good views. Bike lane on and off. Quiet route. At 13Ks onto 179. At 18Ks, straight onto 196. Variable bike lane. Sometimes more wide and smooth. West (head) winds. 196 has lots of traffic. Mostly flat. At 41Ks, bear left toward the city center (there’s a sign). 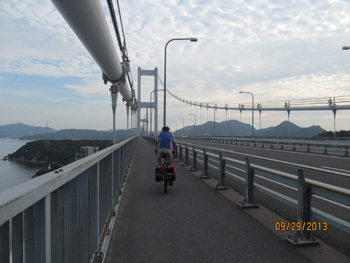 Bike lane next to road into Imabari at 48KS. Hwy 317 to Hwy 161. Follow signs to bridge. The bike route is marked with a Blue line on the pavement. At 5Ks path snakes up to bridge at 7Ks. At 11Ks, off highway onto the island. Follow Hwy 317 on bike lane. Lots of up 1k, down, up 2Ks down. Very traditional houses. At 22Ks T-junction. Left along coast. Snake up to bride at 25Ks. At 27Ks right along Hwy 316 gradual hill to short bridge at 30Ks. Snake down to the coast. Snake up to bridge at 38Ks. Snake down to the coast. T-junction right at 41ks. Longest and least interesting flat route to path winding up to the bridge at 53Ks. Snake down to Hwy 317 at 57Ks. Right, narrow road to 59Ks, right gradual up and down to T-junction at 62Ks. (Hwy 367) left. At 63Ks, right on quiet narrow road. Rolling. At 64Ks, T-juction. Right. At 66Ks, snake up to bridge. At 68Ks, right and right again at coast. At 77Ks, left to ferry at 78Ks. Ferry to Mukaishima Island. Left at first main road. With a map circumnavigate around Mukaishima Island. Great views. Quiet roads. Under bridge along coast, back to ferry at 20Ks. It’s 61Ks via Hwy 2 but we took parallet routes all of which probably added 3Ks to the trip. Often we rode on small quiet roads for 7 or 8Ks and easily got back to Hwy 2. Touchstones are Hwy 2, of course and the train tracks. We did screw up and added 10Ks around Kasaoka. Usually, on one side or the other, there is an adequate bike lane along Hwy 2. Into the center of the town after crossing the river, near on 429 (signal). The bike lane is narrow. By Hwy 2, it’s 22Ks, but we went via Hwy 22 south then Hwy 30 to turn for Hwy 74. A small road around the penninsula then accross the bridge toward Yokohama. (A bike land) then off along the river into town. Longer but some parts are good riding. Just a series of wrong turns. (I think it’s possible to go north along the river). Met a Japanesse Biker who led us to Hwy Z (just what we wanted to avoid). At 24Ks there’s a great little road on the other side of the rail tracks right into Bizen. At 32Ks, Hwy 250. Right. On and off bike lane but less traffic. At 43Ks, Hinase. Pretty town on a bay. Hwy 250, on and off bike trail. Moderate traffic, some trucks. Some hills. West (head) wind. Ako (a city) at 15Ks. Along a river then across at 18Ks. Bike lane on righ then left. At 20Ks, up and no shoulder, Nasty! 2Ks up and 2Ks down with heavy traffic and trucks. Thru Aioi at 25Ks. Along coast on 250 which is now quiet. Lots of curves. Nice views. No bike lane. City riding into Himeji at 52Ks. Lots of stoplights. Simply along Hwy 2. There a bike lane all the way. All urban, lots of stoplights. Slow. Flat, a few parallel street from time to time. Kobe is complicated. Along (actually under) the Freeway route for awhile on the service road. It was good but at rivers, it stops so back to Hwy 2 again. Very nice past the beautiful Akashi-Kaikyo Bridge. There’s even a bike path along the sea for awhile. Again along Hwy 2, flat. Always a good bike lane but very slow. Lots of stoplights, very urban. Osaka is a huge urban area. Take a path on the Okawa River to get to the Yodogawa River and follow the various bike paths. They are near the river or below the levees or on the levee. There are many barriers (to keep cars out) that you have stop to get your bike thru. In 2013, a typhoon ripped up parts of this complex of paths but there is always at least one path intact. A really nice break from city riding. Into Kyoto, more city riding but there are lots of straight little side streets to take. (They were working on clearing the debris when we were there October 2013). Find the Katsura River, take the bike path on the east side of the river at 14Ks, curve around and over the bridge. Now down the east side of the Kizugawa/Yodogawa river. At 44Ks, at a DAM, left along the Okawa River. At 48Ks, over river to other side. Off on Matsuyamachi then into the Namba area in Osaka on city streets at 51Ks. Out of the city on Hwy 26. Very Urban. Lots of stoplights. At 14Ks Sakai, stay straight onto Hwy 29. It’s more of a highway but the bike lane especially on the left is smoother and has far fewer stoplights. At Rinku Town, you have to take the Shuttle Bus from the Mall to the airport, they take bikes for no charge. Rinku town at 42Ks.